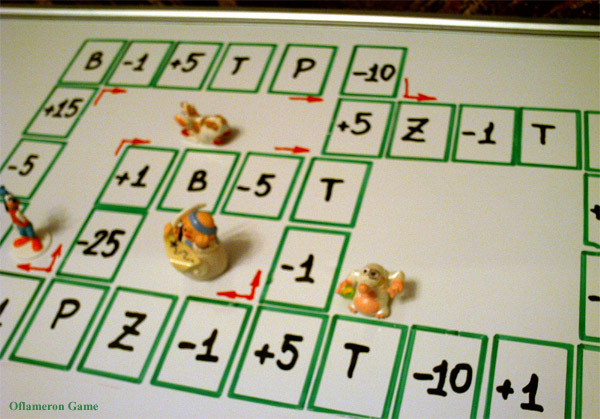 Free board game for kids. Russian games on board. 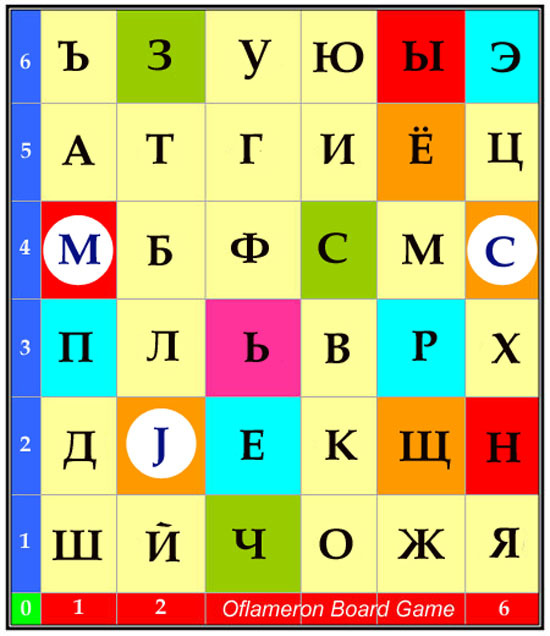 Free russian games with dice. 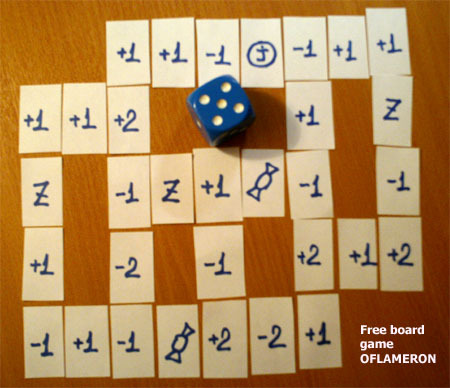 OFLAMERON , an original card game has a lot of versions, including the one without cards at all. It's very convenient, when you don't have playing cards at hand - for example, during a trip, visit or rest. Sometimes you need to entertain children somehow, but none of the known games kindles interest. Suggest their playing "Oflameron". The game is easy to arrange anywhere. 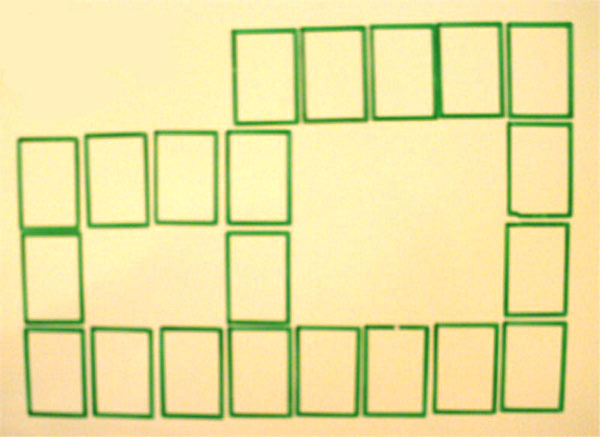 You can just draw the playing field on a sheet of paper, cardboard, plastic board with a pen or marker and substitute playing cards with cells with the same values. Look, how easily you can make a nice playing field. Instead of a sheet of paper we're using a white magnetic board and markers. Drawing chips with a red marker (but you can use small toys), and instead of a die we are using the respective application for iPhone - a die emulator program. Here you can use small magnet toys as chips. 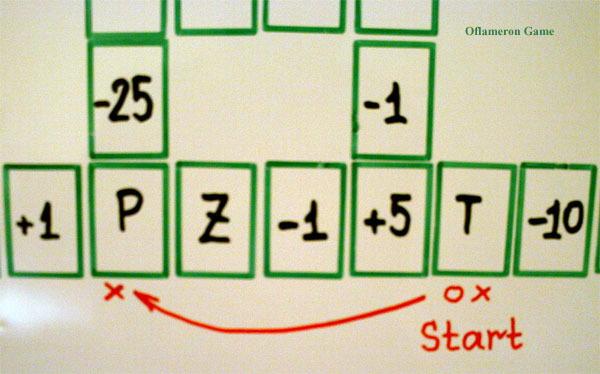 If you can lay your magnetic board horizontally, you can use any small toys. 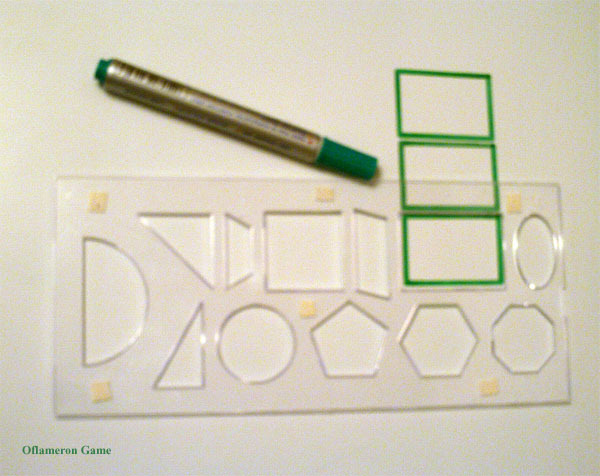 To draw cells of the playing field on the white plastic board, let's take a stencil ruler with rectangular holes. On the reverse side of the ruler there are small rectangles made of several layers of "Skotch" tape or paper (not visible in the photo) attached not to blur the drawing under the ruler. Instead of the ruler you can use a self-made stencil made of cardboard or thick paper. If you can't make a stencil, draw the rectangular cells by hand. 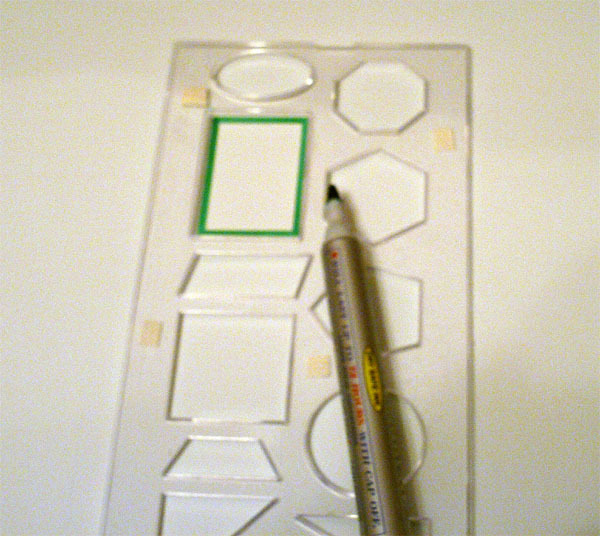 Draw playing field cells with a special marker for white plastic board. The cells form closed paths. The playing field may of any size and complexity. The playing field may have crossings and branches. All paths must form closed loops. For children aged 7-8 such drawing will be a good training. It won't be an easy matter for them to draw playing cells on a big field and not to slur them. The simplest playing filed consists of two closed paths (loops). To keep up the interest to the game you can draw additional paths every time. It'll be a good training for children. They'll have to write the values carefully and not to slur the drawing. To maintain the interest to the game, you can make the playing field more complicated by drawing new paths. 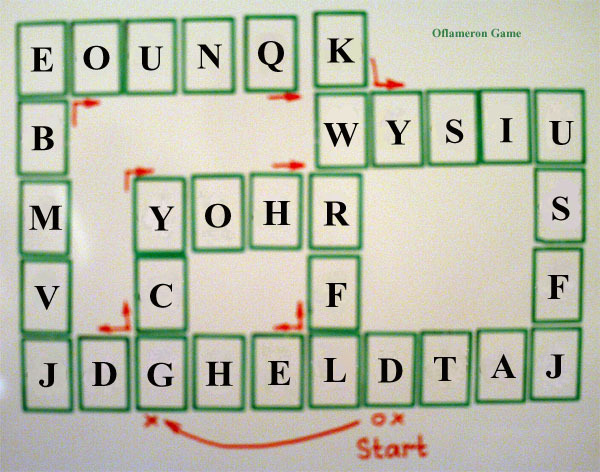 The "Oflameron" game starts, when the players place their chips (or draw their signs) on any cell at the bottom of the playing field. As a rule, it's the cell with the maximum value. The players may start with the same cell. The players score the respective number of points. 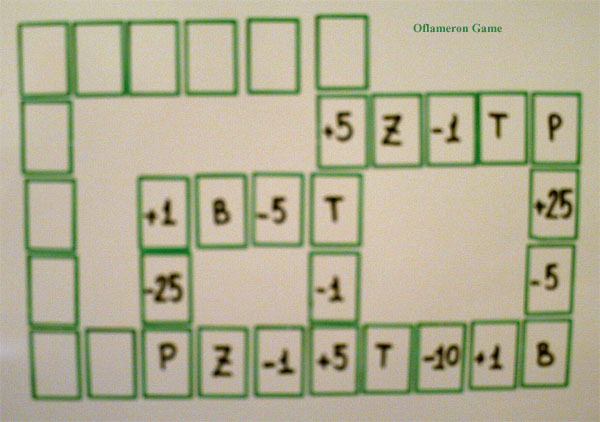 Here the players have placed signs on the playing cell with the [T] value, and thus scored 500 points. Now the players are to throw a dice (start up die imitating iPhone application or to throw a real dice). 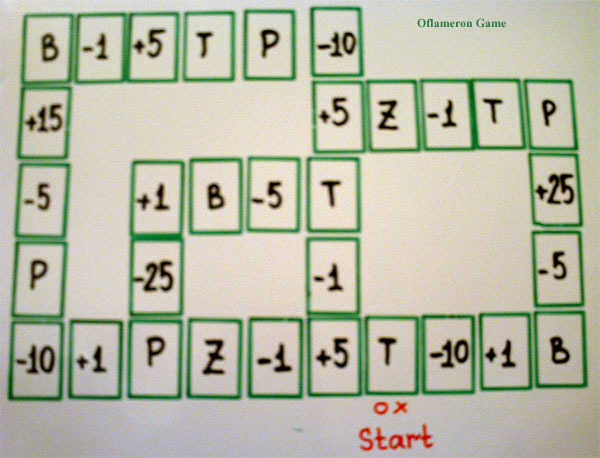 Depending on the number of points on the die a player moves his/her sign (chip) to the respective number of cells clockwise. 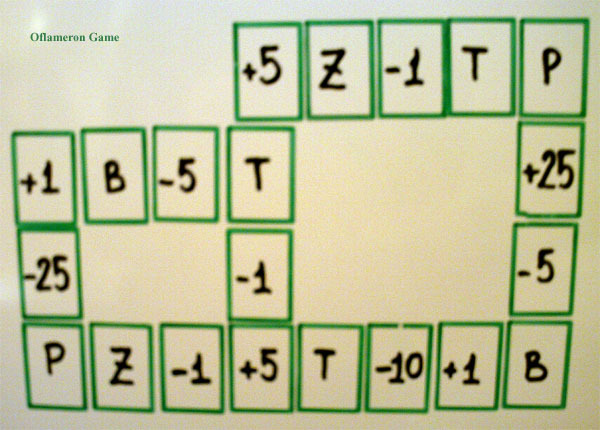 Here there are 4 points on the die, and the player has shifted the sign by 4 cells to the left. The sign is on the cell with the [P] value, and the player scores 100 points. 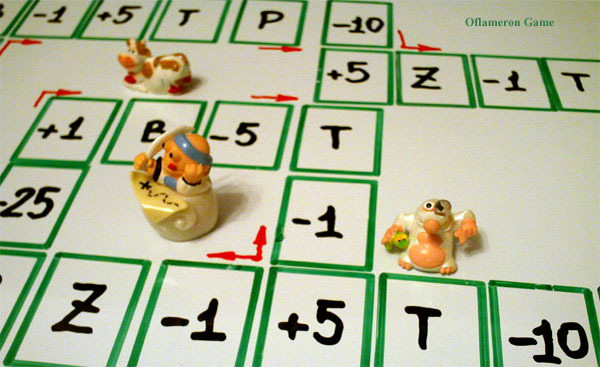 The other players throw the die and shift their chips or signs, and score or lose points. 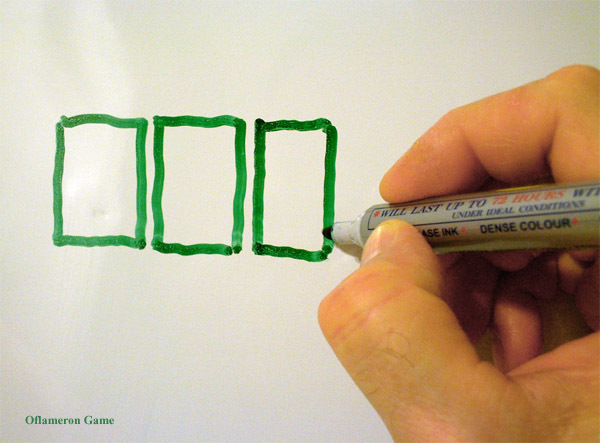 The game is over, when the score of any player becomes negative, or if one of the players places the sign (chip) on the cell with [End] value (it can be done on purpose in order to win). You can see in the photo, that the playing paths have branches. A player on his/her own chooses the direction of movement for his/her chip. The arrows in the photograph show the possible direction of the players' chips movements. The game may go on for a long time or the number of moves may be limited - the players should agree on this before they start playing. 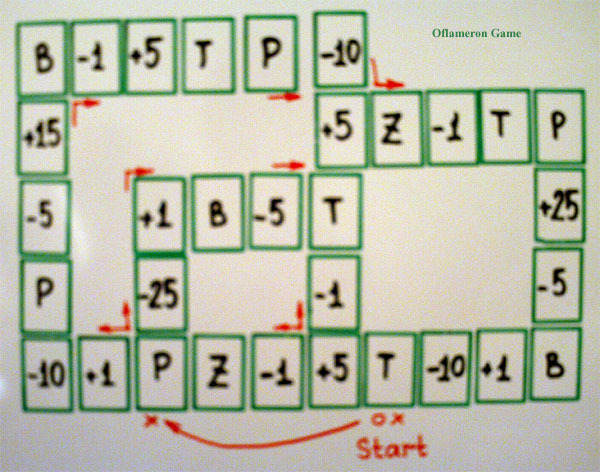 If a player gets a money reward for each point scored, "Oflameron" will be a gambling game.